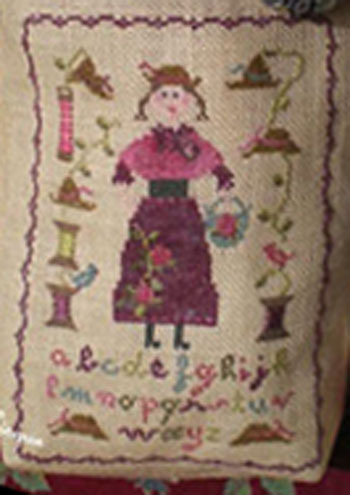 "Louise Reel" is a cross-stitch chart with instructions translated in English. Specialty stitches: This is a cross-stitch design with some satin stitch to figure the thread on the reels (especially for the miniature work as you may use cross-stitches instead if you work this design in full size). This pattern shows 12 colours (both Gentle Art threads or DMC stranded cotton number on the chart). The model on the picture has been stitched on a 32 count linen fabric (Zweigart ref 3009) as a miniature using one strand of cotton over one thread of fabric. But you can stitch it in full size with two strands of cotton on the fabric of your choice (aida, evenweave or linen). Recommended Fabric: of your choice regarding the type (aida, evenweave or linen) and the stitch count, colour "light sand, 35x40cm (14x16 in).